Autoliv's night-vision system detects temperature differences among objects in the road. If a pedestrian or animal is detected, the motorist gets a warning two to four seconds before the vehicle appears likely to hit it. Autoliv Inc. is preparing to roll out an upgraded night-vision system next year that can identify large animals such as deer, cattle or horses in the road. The Sweden-based safety equipment supplier has production contracts for its third-generation night-vision unit, but it did not disclose its customers. 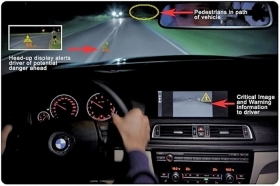 Autoliv's current night-vision customers include Audi AG, BMW AG and Rolls-Royce. Automotive night vision has been on the market for a decade, but has yet to break out of its niche. Part of the reason is cost. In 2000, General Motors introduced a Raytheon-designed system in the Cadillac DeVille, an option that cost consumers $2,250. After an initial burst of interest, sales tailed off. GM stopped offering the system in 2004. Will Cadillac revive that technology? "It's something we are familiar with, and it's something we've looked at," said Cadillac spokesman David Caldwell. "Will we have a night-vision system? Not necessarily soon." Japanese automakers also have shown interest. Lexus rolled out a night-vision system in 2002 on the Lexus LX 470, and Honda introduced its own version two years later in the Legend, although it isn't sold in the United States. Autoliv's current system, introduced in 2008, costs automakers less than $1,000 per unit. But a big improvement in sales could come when Autoliv develops a less costly version of its far-infrared night-vision camera. If a fourth-generation version is approved, it could be available in about five years at a cost to automakers of $300 or so, said Stuart Klapper, managing director of Autoliv Electronics' night-vision program. If automakers were willing to buy large numbers of units, the unit price would decline and night vision could enter the mass market, Klapper predicted. "We are definitely in discussions with all the mainstream manufacturers," Klapper said. "We are targeting that number [$300 per unit], but we haven't made a final decision about a fourth-generation unit." 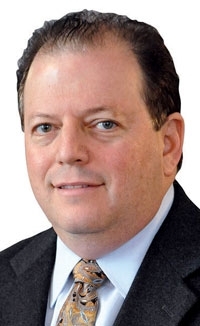 Stuart Klapper: Autoliv is targeting $300 per night-vision unit. Perhaps the most aggressive promoters of the technology have been BMW and Mercedes-Benz. In 2005, the two luxury brands unveiled two types of night vision -- active and passive infrared -- and both subsequently added a pedestrian detection function. Mercedes-Benz chose an active infrared system from Robert Bosch GmbH, so named because it emits a beam of infrared light 164 yards in front of the vehicle. As the light reflects off an object, a camera captures the image and the motorist sees it on the navigation screen. BMW chose Autoliv's system, which is considered to be passive because it does not emit a beam of infrared light. A camera mounted in the grille detects tiny temperature differences among objects in the road, and the motorist sees the thermal image on the navigation screen. A pedestrian or animal appears as a yellow image on the vehicle's navigation screen, and the motorist gets a warning two to four seconds in advance if the vehicle appears likely to hit it. The active and passive infrared systems have strengths and weaknesses. The passive system, with its 328-yard range, has twice the range of an active system, and it does a better job detecting pedestrians and animals. Unlike an active system, it is not affected by foul weather, and it isn't hampered by the dazzle of oncoming vehicle headlights. But active systems are cheaper, and their images are sharper. Active systems also are better at detecting inanimate objects. The rivalry between BMW and Mercedes is fueling improvements for night-vision technology. Next year, Autoliv will unveil a passive infrared unit that can warn motorists about animals in the road. The developers shrank the size of the camera, reduced its cost and improved the quality of the image. The new unit also required a major software upgrade to enable the computer to identify animals. Autoliv engineers spent a year driving vehicles at night in Scandinavia, North America and Asia. "We went to safaris, animal farms and deer parks to capture as much data as possible," Klapper said. What does all this mean for the market? Klapper declined to name the customer that will roll out Autoliv's new system first. While night vision is restricted to the luxury market, Klapper predicts that cost-cutting and performance enhancements will generate more demand. Autoliv sells about 60,000 night-vision units a year. Klapper said the company has contracts to produce it for 37 premium models by 2015, and he predicted sales will rise to 300,000 units. If so, this niche product appears finally ready for the mass market. Said Klapper: "With the new models, we'll see tremendous growth."